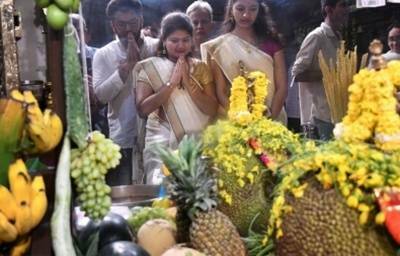 Thiruvananthapuram, April 15 (IANS) Hindus across Kerala on Monday celebrated ‘Vishu’ or the traditional new year, marking the arrival of good luck and fortune. Ahead of the main festival, women in the Hindu households prepare the ‘Vishukani darshan’ the previous night which is a traditional arrangement of their favourite deity, to be viewed the first thing in the morning. A special vessel called the ‘urali’ that consists of fresh produces including cucumber, pumpkin, coconut, plantains, mangos, pineapples, rice, grains and the areca nut, is kept in front of the idols. Elders first view the ‘Vishukani’, after which they wake up others in the house, who are all brought for the ‘darshan’ with their eyes closed. Another important event of the day is the giving away of ‘vishukaineetam’ (gift) which is mostly coins.